A few years ago the John Muir Association and the John Muir National Historic Site gave me and Association member Sherida Bush permission to help develop a display poster for the Site's Visitors Center covering the history of the Muir Mansion and the Site in the years between Muir's death in 1914 and the establishment of the National Historic Site in 1964. Obviously Faire and Henry Sax who bought and saved the property from developers in 1955 would be included but so also would be other families and individuals who had a significant connection with the site during those decades. The Schultz and Kreiss families who owned and lived in the Mansion in the 1930s and 40s are among those deserving attention although I did not know that when I started this project. So I set to work. Naturally, I checked the files of paper and pictures at the Martinez Museum where Executive Director Andrea Blachman and Board Member Marlene Thompson and the rest of the volunteers are always so helpful. Not finding a great deal there that wasn't already well known, I walked down Main Street to the Contra Costa County Historical Association's History Center. Executive Director Betty Maffei (since retired and succeeded by Priscilla Couden) and her helpful volunteers pulled the relevant files and let me sit down and comb through them. There was a lot more material thanks to the Louis Stein Collection and all the papers donated by the Bray family regarding the John Muir Memorial Association, the community group that backed the Saxes efforts to obtain National Historic Site status. Paging through the reproductions of news clippings, copies of legal documents, and old association newsletters suddenly I came across an advertising car. bigger than a standard business card but smaller than a postcard. Aged no-longer-white card stock with simple blue lettering, it promoted "Muir Gardens on the famous John Muir Estate" featuring a pavilion for dancing, a picnic ground and a barbecue pit. I sat straight up in my chair. Having just researched and written a feature about the Bay View Pavilion near Green Street downtown, I couldn't believe I hadn't ever heard a Muir Gardens recreation site "Near Martinez, on the Franklin Canyon Highway.. And who was D. L. Parsowith, the manager. Even helpful Betty whose brain is encyclopedic on county history had never heard of any of this and there was no date noted on the card. Long story short, it took some sleuthing and even more help from the two other repositories of local history our community is so fortunate to have. Dunstan Granshaw, one of the Friday volunteers at the Martinez Museum, looked in the Richmond/Martinez business and residential telephone directories of the 1920s and 1930s that preceded the telephone directories we take for granted today. He found Parsowith's name and profession (tailor) and an address on Franklin Canyon Road. Then at museum volunteer Bettye Bloom's suggestion, I called Tad Shay, Lead Ranger at the Muir Site. He'd never heard of Muir Gardens but did know that someone he thought was a cobbler lived at the Adobe for a number of years. But he was not familiar with the name or had ever heard of a Muir Gardens recreation site. 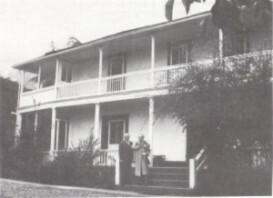 He then took the "Historic Structures Inventory" on the Adobe Park Service staff had compiled in 1991 and armed with the Parsowith name, found the pages covering the over two decades the family owned the Adobe. And sure enough, the Muir Gardens were mentioned in conjunction with a lunch place Pearl Parsowith operated on the road through Franklin Canyon for travelers to and from West County. The Gardens were apparently an offshoot of that but it all came to an end when the restaurant burned in 1927. There is no record of when the enterprise started. But we do know the Parsowiths bought the Adobe in 1921. Tad shared the Parsowith material with me. It is an exhaustive record to the extent discoverable of the changes the couple made to the structure in three decades. Their story ended with Mrs. Parsowith's death on Christmas Day in 1954 and Mr. Parsowith's decision in 1955 to sell the Adobe to Louis Stein, the Kensington druggist whose fascination with and collection of Contra Costa County history is a gift beyond measure to us all. But there's even a story about that. In his later years, Stein told Betty Maffei that when news came that the Adobe and its surrounding land might be for sale, Judge A. F. Bray, already part of a group trying to preserve John Muir's grave and legacy, called Stein and told him cryptically to "take care of it". Stein later told Betty that he didn't know what else to do but go out and borrow $1000 and buy the property which he did. And the County files have his 1955 Christmas card showing the Martinez Adobe to prove it.